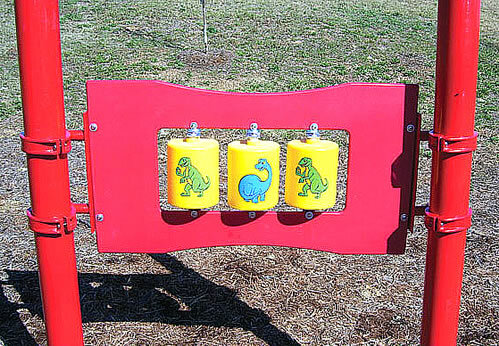 Come on up to this dinosaur-themed play panel and turn the reptile cylinders any way you like! This special needs ADA Dinosaur Panel Play Structure gives your ADA-needs kids 3 fun dinosaur-themed rollers to play with. This is great for the dinosaur enthusiast in your family and always exciting for young children. It also helps teach children by matching up the pictures. There is plenty of room below the panel to fit a wheelchair, and the heights of the post clamps are adjustable with a special star key wrench (included). The design of this play panel meets the American with Disabilities Act. The outside posts are made from galvanized steel, and they measure 3.5″ outside diameter. They are secured in the ground with concrete. Panel separately weighs 35 lbs.